Germany, the biggest economy in Europe and, more importantly, in the eurozone, is being urged to invest more at home. Those that support greater investment argue that it would help to spur a faster recovery in the eurozone and reduce the German current account surplus – lines of argument that meet resistance from the German public and the country’s policy circles. After all, many Germans feel (rightly or wrongly) that they have done enough for Europe. Luckily, the case for German investment can be based entirely on narrow self-interest: for the sake of its future prosperity, Germany needs to invest more, regardless of whether that helps the rest of the eurozone. Why is Germany not investing more, then? The answer is, as so often, political. But there could be a way to convince the German government to do what is best for Germany – and ultimately for Europe, too. German investment has been falling steadily over the past two decades, from around 21 per cent of its GDP in the late 1990s to just above 17 per cent now (see chart one). The biggest drop came after 2000, when the German economy slid into a period of low growth and high public deficits. This led both private and public investment to fall: private investment for lack of profitable opportunities, and public investment because of eurozone budgetary constraints. By international comparison, this is a low number: The EU15 (roughly the eurozone plus the UK) invested around 20 per cent of GDP in the run-up to crisis. Because of the severe recession in many EU15 countries, this has recently fallen to German levels (but notably not below). 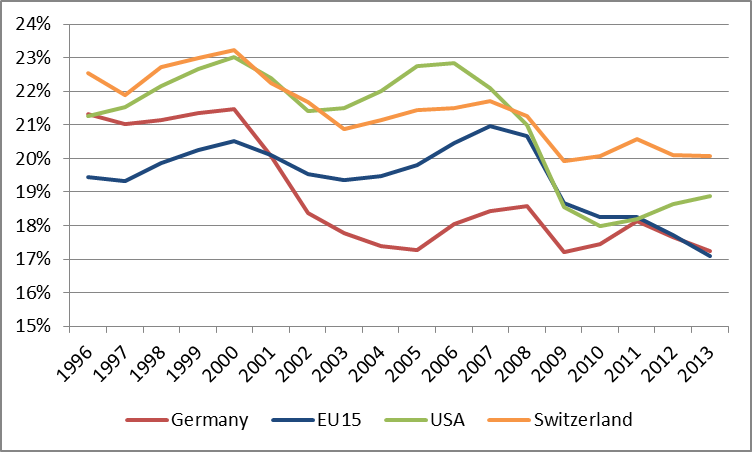 Investment in the US and Switzerland has been even higher. But such overall investment figures can only provide a rough guide: they contain construction and equipment, both private and public, each of which needs to be analysed. In addition, intangible investment such as software, R&D and organisational know-how is not included. 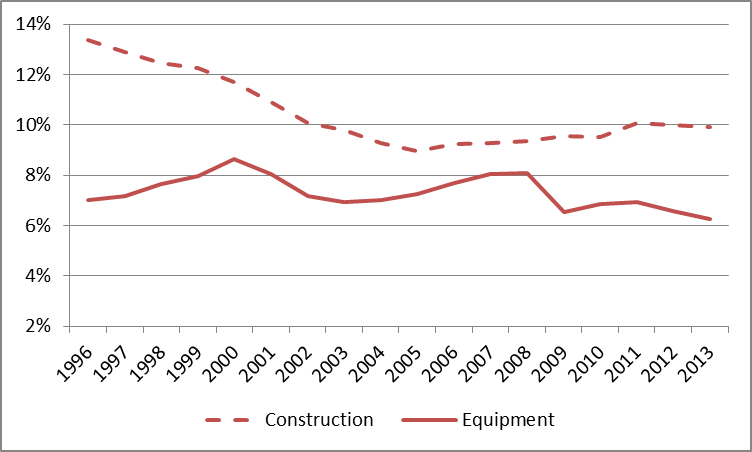 Breaking German investment down into its constituent parts reveals that the fall in construction is mostly responsible for the decline in aggregate investment; investment in machinery and equipment has only decreased slightly (see chart two). So does that suggest that German investment is fine? 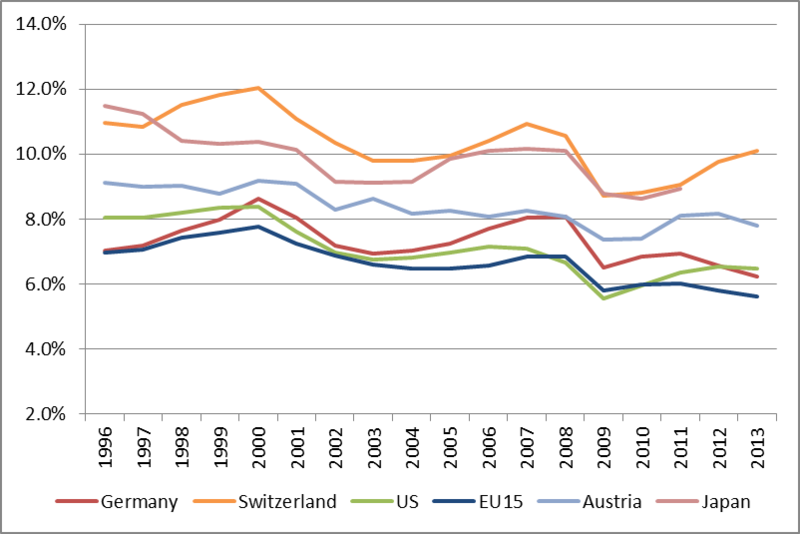 After all, construction investment has not been the wisest use of savings in countries like Spain or Ireland – where much of the money invested was in fact German. However, by international standards, investment in equipment is also low. 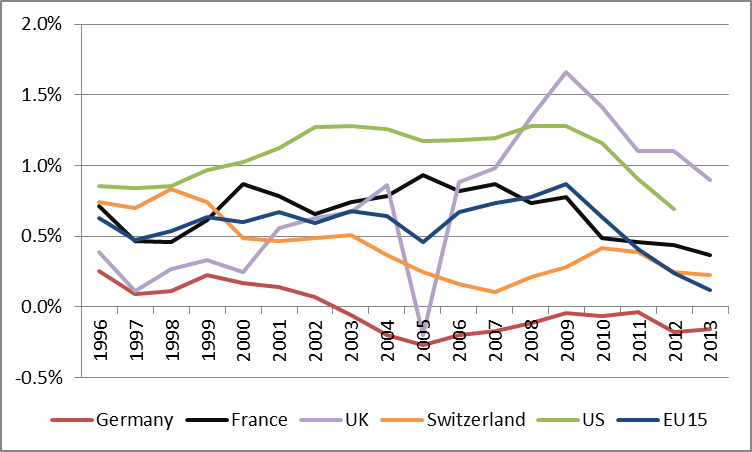 While Germany compares well to the US or the EU15 average (see chart three), its real peer group – countries with similarly large manufacturing sectors – invest considerably more: Germany’s manufacturing value added accounts for 22 per cent of GDP, compared to just 10 per cent in France or the UK, and 13 per cent in the US. The relevant comparison group – Japan, Switzerland and Austria with manufacturing sectors contributing similarly to GDP – invest between 1.5 and 4 percentage points of GDP more than Germany in equipment. This investment gap is not compensated for by intangible investment either. On the contrary, such investment in software, R&D and organisational know-how is low compared to countries like the US that have similar levels of investment in equipment. Germany invests more than 5 percentage points of GDP less than the US, and 2.5 percentage points less than the UK or Sweden. Considering both equipment and intangible investment combined, Germany clearly invests too little. Source: Carol Corrado, Jonathan Haskel, Cecilia Jona-Lasinio and Massimiliano Iommi (2012) "Intangible Capital and Growth in Advanced Economies: Measurement Methods and Comparative Results" and the associated database; European Commission / Haver Analytics Public spending on education is not usually considered to be investment. And yet it is clear that, from an economic point of view, education spending is mostly investment in human capital and should be included in investment totals. 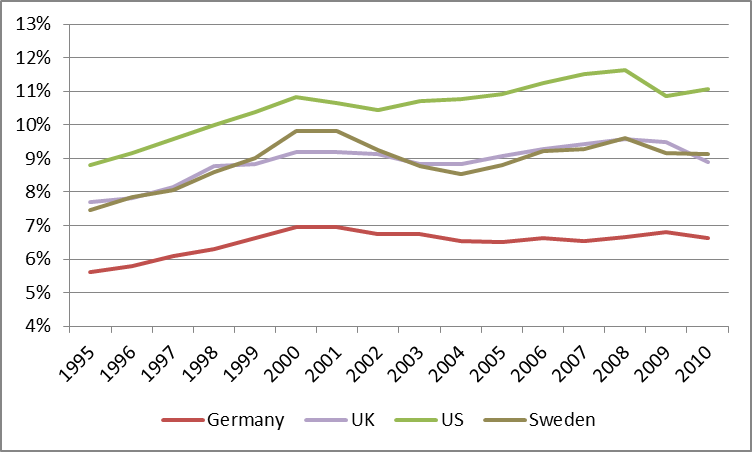 By international comparison, German public investment in education is very low as a share of GDP. 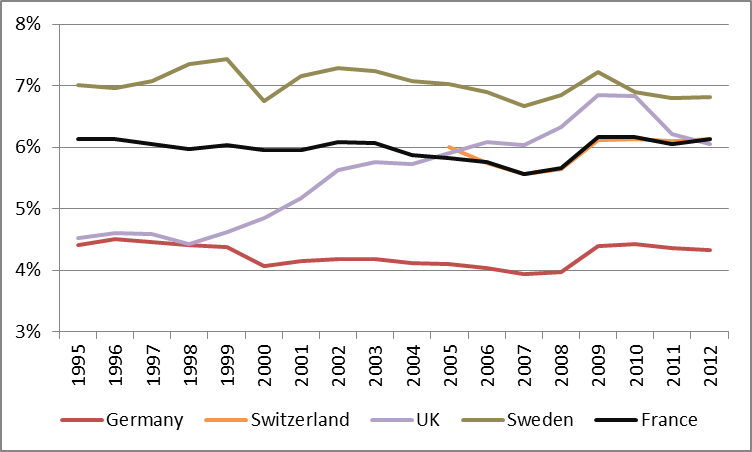 And while the greater number of young people in France, the UK and Sweden explains part of the difference, the difference with Switzerland cannot be explained by demographics; the difference between Germany and Sweden is simply too large to be fully explained by demographic differences, and has been for long. Finally, public investment in construction and equipment is also very low – it is actually negative once depreciation is factored in. After all, public capital deteriorates just like private capital: roads get potholes and school equipment breaks. After deducting depreciation of the existing capital, Germany has been investing less than zero in its public infrastructure and equipment for a decade. In essence, Germany has been running down its public capital stock. All this leads to the conclusion that Germany has not been investing enough: not in equipment, given its large manufacturing sector, not in R&D and other intangible assets to grow new sectors, not in education or in public infrastructure. This is particularly worrying as the German population is aging quickly, with the median age already close to 47 (up from 40 in 1999) – a high number if compared to Sweden (41.2), the UK (40.4) or the US (37.6). An ageing society needs to invest domestically to make its workers more productive, because these workers will need to support pensioners in the future. Productivity growth is especially important in Germany because its pension system is largely ‘pay-as-you-go’: the young pay for the old. If people had private pensions, in which they built up pension pots for their own use, these could be invested abroad, which would make domestic productivity less of an issue. What is more, Germany is saving much more than it invests, the result of which is a massive current account surplus of 7 per cent of GDP. Whatever Germany saves beyond what it invests domestically will be invested abroad. But the German banking system, through which most of these savings are intermediated, has not been able to invest this surplus productively. In fact, Germany has lost around €400 billion on its investment abroad since 1999, according to calculations by the German Institute for Economic Research (DIW). In Germany, their research shows, the return on investment – measured by the economic growth per unit of investment – was among the highest in the world over that period of time. There are essentially two ways for policy-makers in Germany to increase investment. One is to encourage private investment through policies such as predictable energy policies or further liberalisation of services markets, both of which would help. But the biggest impact the government could make is to increase public investment, for a very simple reason: Germany can currently borrow money essentially for free. Interest rates on 10 year government bonds are around 1.4 per cent, which is likely to be below the average inflation rate over the next ten years. This implies that the German government is paid (in real terms) to borrow: the real interest rate is negative. Bonds that mature in 30 years yield 2.3 per cent and hence barely more than the probable inflation over that period of time. Given that the case for more public investment in Germany is so strong, why is the German government not investing more? There are three reasons. First, the German economy is growing relatively rapidly; the Bundesbank recently upgraded the outlook for 2014 and 2015 to 1.9 and 2 per cent respectively. Germany has little, if any, underutilised capacity and such growth figures are a good deal above Germany’s potential growth, that is, the underlying growth rate around which economies fluctuate. This means that there is currently little need for public investment to stimulate the economy further, from a business cycle perspective. In fact, given that the European Central Bank (ECB) needs to keep rates low to help the rest of the eurozone, there is a danger the German economy might overheat. However, German inflation (a key indicator for a boom) is not projected to rise beyond 2 per cent until 2016, according to Bundesbank estimates. What is more, the risks for the eurozone economy are “to the downside”, as Mario Draghi likes to point out, such that additional public investment would serve as an insurance against a renewed eurozone downturn. Second, the German constitution contains a fiscal rule known as the ‘debt brake’ that, after a transition period, comes into full effect in 2016. It mandates that the structural balance – the budget balance after the effects of the business cycle have been taken into account – does not exceed 0.35 per cent of GDP. This in effect excludes debt-financed public investment in Germany in the future – a questionable rule to begin with, given the arguments above. However, until 2016 at least, the government has room to go beyond the 0.35 per cent limit and should use this fiscal space. According to KfW, a German state-owned bank, the German government could invest €100 billion more over the next five years (which equals roughly 3.5 per cent of current GDP) without violating the transitional rules of the ‘debt brake’. Finally, the most important reason why public investment is low is that fiscal consolidation is politically more appealing in Germany than investment: after decades of belt-tightening and fears of ever increasing public debt, a balanced budget is seen as a big accomplishment. This is why the coalition agreement between the two governing parties contains a balanced budget pledge that goes beyond the constitutional debt brake and aims for a faster fiscal consolidation. Unravelling this pledge now, the argument goes, would open a Pandora’s box of government consumption demands and hence not increase investment. Therefore, it is best to keep the lid on it, despite the beneficial effects of more public investment. The only way to convince the German government to invest more is to emphasize Germany’s gains from such investment rather than Europe’s; to make sure it is politically more profitable than fiscal consolidation; and to ensure that the added fiscal spending really does go into investment rather than public consumption, and preferably sooner rather than later. One proposal that fulfils all three criteria could lie with German municipalities. First, they are responsible for roughly two thirds of German public investment. Second, they are heavily indebted, some are essentially insolvent, and need help. And third, they are the main stumbling block for dismantling Germany’s local business tax (Gewerbesteuer) – a tax that generates volatile revenues for municipalities; that is uneven both between municipalities and between firms of different types and sizes; and that complicates the German corporate tax system unduly. Wolfgang Schäuble, the German finance minister, has in the past attempted (but failed) to reform municipal finances and to dismantle the Gewerbesteuer. He could offer the municipalities a grand bargain: €133 billion – the total debt of German local governments – in debt relief and investment funding for municipalities in return for a comprehensive reform of municipal finances. The political benefits of such a deal would be significant and arguably higher than those of fiscal consolidation: removing the municipal business tax is the holy grail of German tax reformers, and municipal spending is an important issue for the public; additional funds would be spend on investment rather than consumption; and the benefits of such investment would accrue visibly to the German public rather than to other European countries. But whatever the details of a deal, convincing the German government to invest more will not be easy.